One does not have to be a bird lover to admire these graceful creatures. Birds are one of the most lovable animals in the world. They come in a wide range of colors, including metallic iridescent hues. Birds can be shy, intelligent, aggressive, meticulous and even outgoing, the personality traits that young children relate to. Kids love birds as much as they love other slimy, slithery or furry animals. In fact, most of them keep a bird as their pet. Their colorful feather, sounds and funny antics, fascinates them to no end. Here is a coloring sheet of a parrot, one of the prettiest birds you can lay your eyes on. Parrots are one of the most intelligent species of birds. Teach your child more about parrots with this coloring sheet. There are around 372 species of parrots found all around the world. 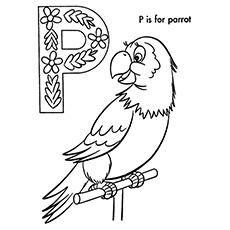 Parrots come in a variety of bright colors, so let your child bring out all his crayons as he gives color to this parrot. This coloring sheet features an owl resting on a tree branch. 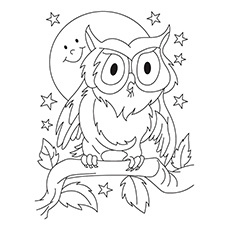 This diagram will help your child learn some fun facts about owl while coloring it. Owls have fascinated people from time immemorial. In some cultures, they are symbols of wisdom while in other cultures they are harbingers of death and doom. There are around 200 species of this nocturnal bird. These mysterious birds are noted for their night prowling for food. The diagram features a flamingo in his signature stance – one leg raised and the other tucked beneath the body. Make sure your child has his pink crayon ready to add a splash of color to this feathered creature. Flamingo is a type of wading bird belonging to the Phoenicopteridae family. There are around four species of flamingo in America. A well-fed flamingo is vibrantly colored while a white colored flamingo is usually unhealthy and malnourished. 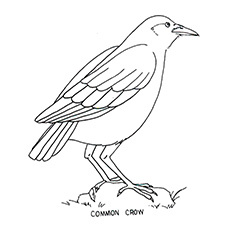 This is a coloring sheet of crow, one of the most commonly found birds in India. A crow is a black bird with gray plumage. It has a stout body with strong bills and legs. Throughout the history, the crow has been associated with both positive and negative symbols. In some cultures, a crow is associated with bad omen, death and witchcraft while in others it is considered a sign of luck. 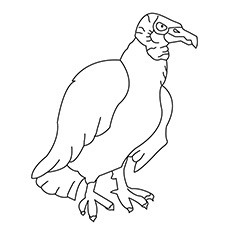 Here is a coloring sheet of a vulture, one of the creepiest looking birds. Vultures have a bad reputation, but the fact is that they rarely attack humans or healthy animals. A vulture feeds only on dead animals. A group of vulture is called a wake or a volt. Vultures have a wide wingspan that allows them to soar for longer periods without flapping much. Vultures have a sharp, hooked beak that they use for ripping meat apart. Their long neck helps them avoid infection. 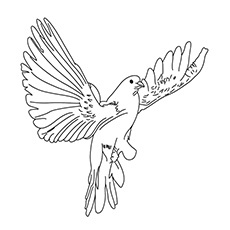 This coloring sheet features a dove holding an olive branch. A dove with an olive branch is recognized as a symbol of peace. A dove is a bird from the pigeon family Columbidae. They have small bodies and long tails. It is one of the most fascinating and attractive birds. A dove is known for its explosive flight. 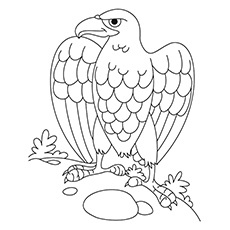 Here is a coloring sheet of one of the most majestic birds, an eagle. There are more than sixty species of eagles. An eagle is a large and powerful bird with a heavy head and beak. It has long and broad wings that give them the fastest flight. Eagles are admired all over the world as a symbol of power, freedom and transcendence. Eagle is also the national bird of the United States. Pelicans are fondly known as flying fishermen. 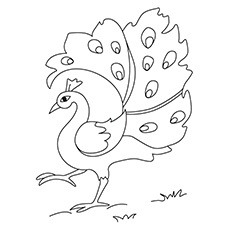 Your child will enjoy filling coloring in this graceful bird. 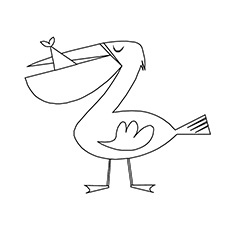 As your child colors the sheets, talk to him about pelicans and the big pouch they have to hold the fish. A pelican is a large bird known for the pouch it uses to scoop fish out of water. It is found worldwide, dwelling near water and densely populated fishing areas. The pelican is an enormous bird, with some species having wings as large as 3 meters. There are around eight different species of pelicans. The peacock is the most beautiful bird in the world. The small spaces in this coloring sheet will help to strengthen the fine motor skills, the muscles that are used for writing. 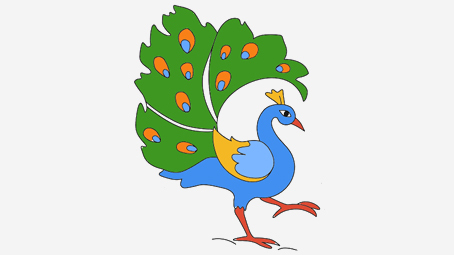 The peacock is the national bird of India. It is a symbol of grace, beauty, joy and love. It is a colorful, swan-sized bird with a fan shaped crest of feathers. The male species is more colorful than the female specie. 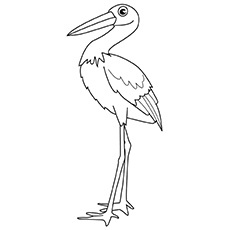 Here is one of the interesting bird coloring pictures that features a stork. Stork is a long necked bird belonging to the Ciconiidae family and ranges from 60 cm to more than 150 cm in height. It is said that storks are voiceless due to the lack of fully developed vocal organs. They usually fly with neck outstretched and legs trailing. They are found mainly in Africa, Europe and Asia. Your bird lover will love adding brilliant reds and oranges to this beautiful bird. 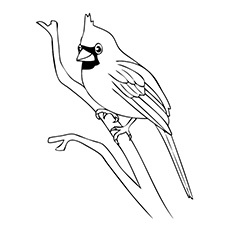 Talk to your child a bit about cardinal as he colors this beautiful bird. Cardinal is the state bird of Kentucky. It belongs to the family of passerine birds found in North and South America. 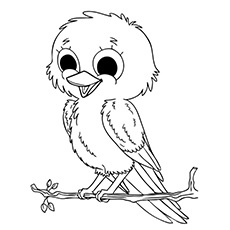 Your budding ornithologist will love learning about this bird with this coloring sheet. The finches are passerine birds in the Fringillidae family. These small birds have forked or notched tail, pointed wings and elongated bodies. The bill shape varies according to the type of food. 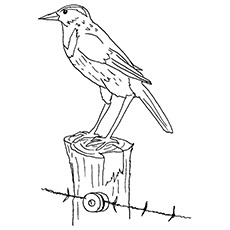 Here is a coloring sheet of a little woodpecker perched on a tree limb. It looks like he is busy pecking his own nestle hole. Woodpeckers live in the tree holes that they make themselves. A woodpecker is an endangered species and is in danger of becoming extinct. This coloring sheet is a great way to teach your child about the importance of preserving wildlife in a fun way. A woodpecker is found worldwide, except for Australia, New Guinea, New Zealand and Madagascar. Here is a coloring sheet of a robin, the bird famous for laying bright, blue eggs. This migratory bird belongs to the thrush family. This bird is active mostly during the day and assembles in large flocks at night. It is around 25 cm long and has a gray-brown upper part. This bird is widely distributed throughout North America, Mexico and Canada. It looks like this turkey wants to make new friends. This coloring sheet is detailed enough for older kids who enjoy coloring. A turkey is a large bird native to the forest of North America. It is closely related to the other farm birds like quails, chickens and pheasants. The turkey is prepared as a special meal on Christmas and Thanksgiving. Mockingbird is a group of passerine bird belonging to the Mimidae family. It is known for its habit of mimicking the sounds of other birds and insects. There are around 17 species of mockingbird. Most of them are reddish brown in color. The mockingbird is the state bird of Tennessee. 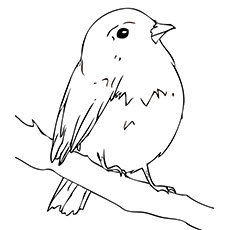 Here is an extremely adorable coloring sheet of a canary. The canary is a small songbird, originating from the Micronesian Islands. Its beautiful voice, color and charming nature have endeared to many bird enthusiasts. This bird was brought over by Spanish sailors to Europe. This bird was originally owned by the rich, but eventually it became popular with the masses. 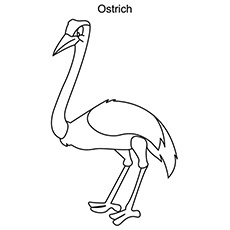 This ostrich-coloring sheet will appeal to all the animal lovers. 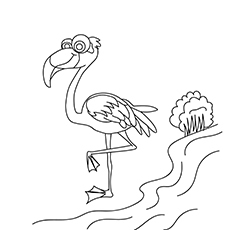 This coloring sheet shows an ostrich burying its long neck to the ground. An ostrich is the largest bird in the world. It is usually found in the African savanna and desert lands. The legs of the ostrich are its formidable weapon. It can kill a human or a potential predator with its one kick. 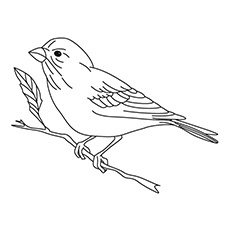 Enjoy this coloring sheet featuring a cute sparrow. 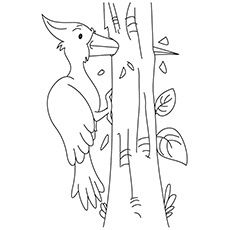 Your child will learn about a new species of bird while having fun coloring this sheet. 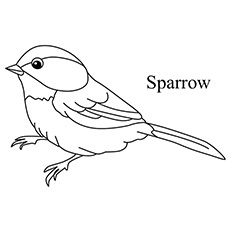 A sparrow is a member of the Passer genus. Sparrows are often found making their nests near houses or buildings. This Western Meadowlark was chosen as the state bird of Nebraska. Meadowlark is a medium sized bird found in the grassy areas of North America. It prefers grassland and open fields to thrive. This bird has a black V on the breast and white flanks streaked with black. Each bird contributes to its natural niche, teaching children that everyone has something to contribute to the society and family. These free printable bird coloring pages online will help your children learn about the different species of birds and their unique features. 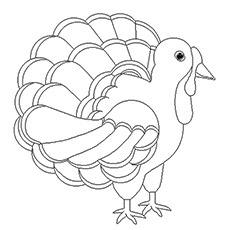 You can also create your own bird coloring book. 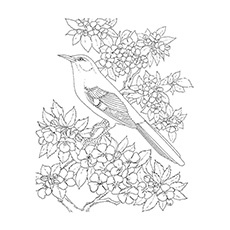 We’re sure you will love teaching about the different birds through these coloring pages of birds. Share your experience with us in the comment box.